Tarpon are a big game fish that flourish in the warm waters of South Florida. Ranging from 20-200 pounds, tarpon are the largest inland fish in Fort Lauderdale and are a favorite for inshore fishermen. On our tarpon fishing charters, we fish aboard our 24ft Bluewatercenter consul. It is the perfect inshore fishing boat for fishing these inland canals. This trip is best for a group of 4 anglers or less. This boat can be chartered for an inland fishing trip or if the day is nice and you want to do a longer trip, we could do an offshore fishing charter. These prices are for Private Charters (up to 4 persons) aboard our 24ft Center Console Bluewater Fishing Boat. 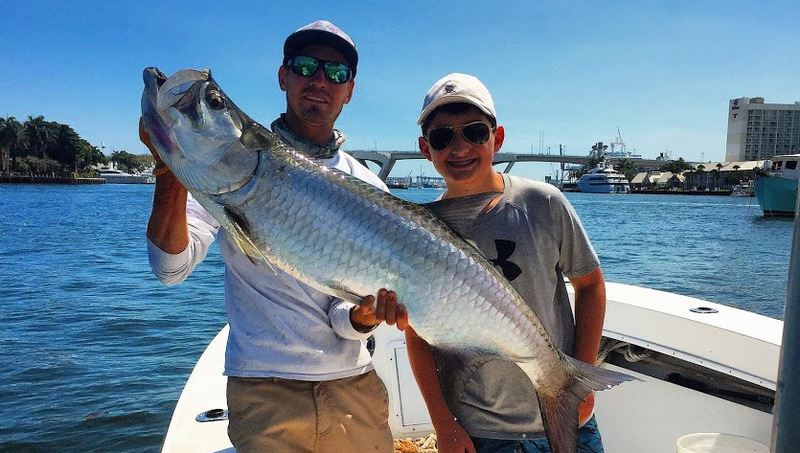 Fort Lauderdale is home to some of the best inshore fishing in south Florida for Tarpon, Snook, Barracuda and other inshore gamefish. Fort Lauderdale is known as the “Venice of America”, because the entire city is interconnected through a series of canals known as the Intracoastal Waterway. In these shallow waters, there are a lot of great gamefish to catch. Tarpon are a gamefish that live abundantly in these waters and are a very sought for light tackle fishermen. Snook and barracuda are also gamefish species that live thoughout these waters and can be caught seasonally in Fort Lauderdale. Jack Crevalle are another carnivorous species that hunt in schools and are caught in these same waters. Chum fishing and getting Jacks chummed up behind the boat is a lot of fun and excitement. Whatever fish species you’d like to go after, inshore fishing in Ft Lauderdale will be a lot of fun. Snook are another inshore fish that we catch when fishing for tarpon. Snook are an excellent eating fish and when they are in-season, they make a great meal for a lucky angler. Snook are considered one of the top inshore gamefish in the world. They breed and spend their life until juvenille among the mangrove trees. Once reaching adequate size, they venture off and live in the inshore shallow waters, around boat docks and throughout the intracoastal waterway. Snook are a cunning fish and only take a bait when it is presented perfectly.